Leila al-Shami, co-author of Burning Country, a writer who has worked with human rights movements in Syria and elsewhere in the Middle East, gave this interview to Ilya Matveev and Gabriel Levy on 29 November (before the fall of Aleppo to the government forces). It also appears on the LeftEast site, and will soon be published in Russian on OpenLeft, as part of a transnational discussion between activists. Kazakhstan’s main independent trade union confederation is fighting for its life, as a court reviews a “justice” ministry bid to have it shut down. 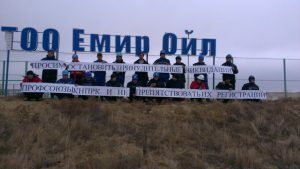 Workers at Emir Oil, Kazakhstan, display a banner protesting at the legal attack on independent trade unions. Photo by KNPRK. the workers’ movement is not beaten: strikes, even where organised outside the law, are forcing employers and state authorities alike to back off. The Justice Ministry’s case against the Confederation of Independent Trade Unions of Kazakhstan (KNPRK) opened in Shymkent, in the south of the country, on 5 December. 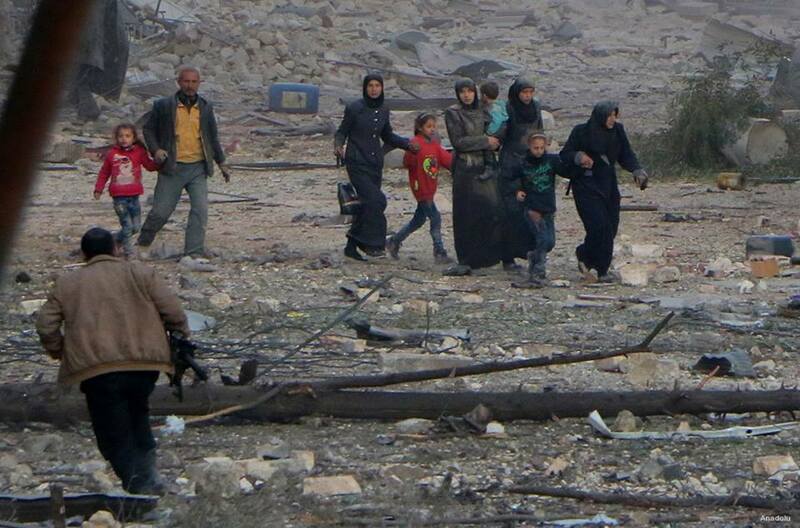 Aleppo is being drowned in blood. The Assad regime’s armed forces and Iranian-supported militias are doing the killing, supported by Russian air power and armed with Russian weapons. The “great powers” are standing by and letting them get on with it. 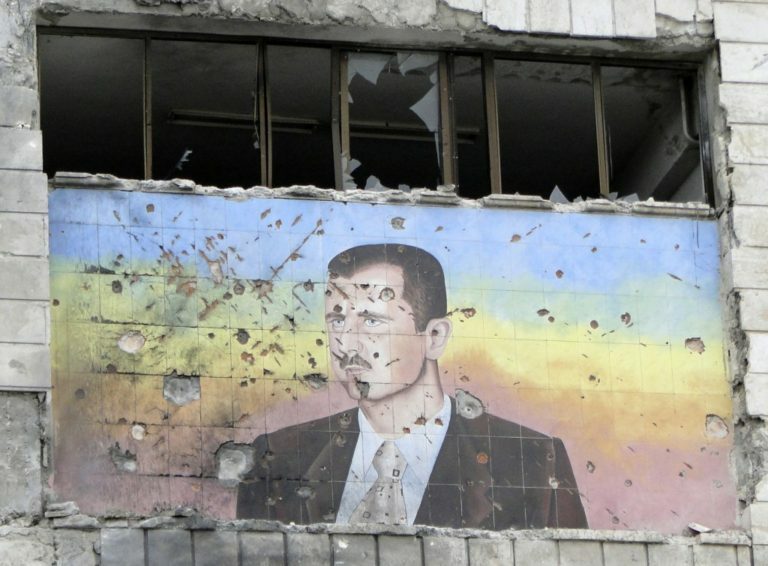 This is a disastrous setback for the popular uprising that started in Syria in 2011, although even now that movement of social liberation has not been completely defeated. These are some facebook posts from Aleppo and elsewhere, shared by Syrian friends. From Raed Fares on 12 December. A Pakistan government programme to force refugees out of Pakistan and back to Afghanistan is causing extreme hardship, as the majority have no home to return to, no family and no way to make a living. As a result the situation for internally displaced people (IDPs) in Afghanistan is deteriorating rapidly. Things were bad enough prior to Pakistan’s action. A recent report by Amnesty International stated that the number of IDPs in Afghanistan has doubled to 1.2 million in the past three years, as increasing violence and poverty continue to push people from their homes. According to Amnesty, “those internally displaced live in horrific conditions, on the brink of survival, with little access to food, education or health care”. The photographer and activist, Guy Smallman, started going to Afghanistan regularly in 2008, when he first visited the Char-e-Qamba camp for IDPs in Kabul. He documents some of the children living in the camp in a beautiful and moving new book of photographs, The Displaced. 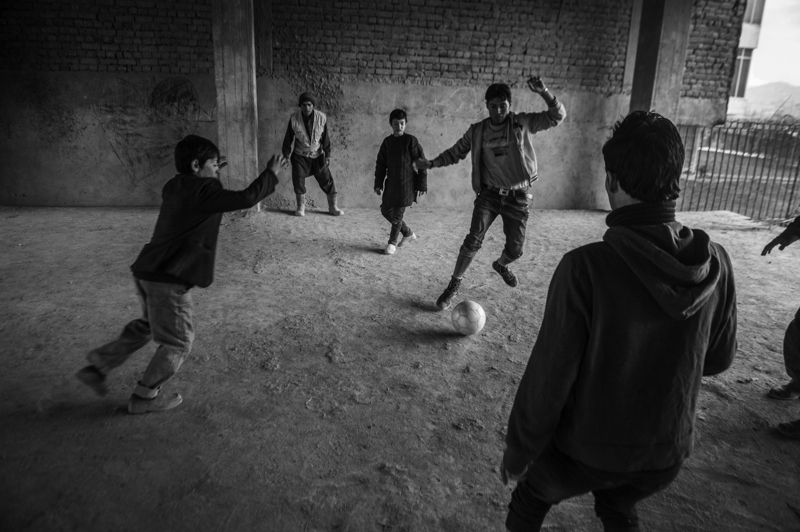 Boys at the Chamn-e-Babrak camp playing football in the car park of a semi-completed but long abandoned housing development (2014). By Guy Smallman. You are currently browsing the People and Nature blog archives for December, 2016.